The Rundown: I hope you are fluent in Japanese, because The Milkees, formed in 2004, are one of Japan’s finest Pop/Rock bands. 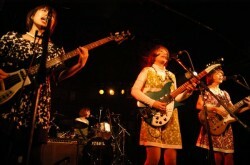 I don’t happen to speak Japanese very well, but the best I can tell, the current lineup consists of Berry (guitar, vocals) PECO (guitar), Lili (bass), and Petora (drums). When you listen to The Milkees, the first thing you will notice is that they tend to blend English and Japanese lyrics. So if you are like me and not quite up to date on your Japanese, at least you will be able to understand some of what you hear. The next thing you’ll notice about The Milkees is that they also blend genres. Listening to them is like listening to 50s/60s Pop Rock, Surf Pop, Punk, and Garage Rock with a hint of Jazz for good measure. Reading that, you’d think the sound would be less than impressive, but that is not the case. The Milkees make some very nice music. Another thing I really like about this band is their harmonizing. Especially in their song Breakaway, the harmony their voices make is fantastic. This is some super catchy, fun msuic to listen to. MarsBands.com is pretty sure you’ll like The Milkees. Be sure to give them a listen.